Report. Only between Saturday and Sunday were detected 676 red dots. The municipality of San José is the most affected. Risks of forest fires. According to the report of the Satif, 46% of the Department presents risk of occurrence of extreme forest fires. Only between last Saturday and Sunday there were 676 burning spots. Also, Yovenka Rosado, who is responsible for the government’s fire mitigation program, explained that, to date, they have added 3,633 outbreaks. The municipalities most affected by the burning are: Concepción, San Ignacio, San José, San Miguel and Puerto Suárez. “We are in one of the most critical months of forest fires and the smoke we have is a product of these contingencies,” he explained. Municipality of San José, the most affected. Several fire departments were deployed to the municipality of San José, since there is a forest fire emergency that could affect the National Park and Kaa Iya integrated natural management area. “We have an emergency that is happening very close to the Kaa Iya Park. 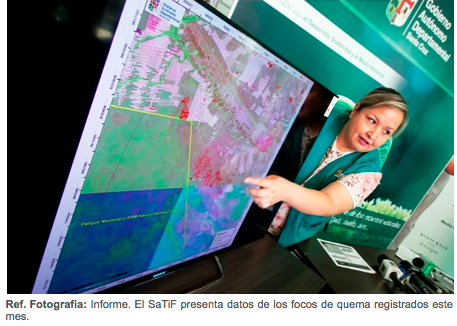 So far, some 6,000 hectares of forests and affected crops have been counted,” said Rosado. Work will be done to prevent the fire from reaching the communities, at the moment there are no people affected. 655 Burning points were recorded on the 7th of this month, the highest number per day. This entry was posted in Bolivia, Environment, Health, Santa Cruz, Social Unrest and tagged environmental damage, fire and smoke, government failures, uncontrolled fires. Bookmark the permalink.